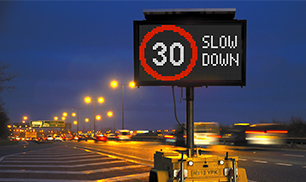 Providing high quality red, amber and white graphics, the Advantage HDC Tri-Colour mVMS is capable of displaying EU pictograms and a very accurate example of the red and white Highway Code traffic signs. High resolution screens allow real time traffic information. The compact model of our Advantage HDC Tri-colour sign, at less than 750kg, has a very efficient footprint and is ideal for areas where space is at a premium. With the same functionality as the larger Tri-Colour model it has the ability to display high resolution, accurate Highway Code messages in real time. The compact Advantage 4260 is ideal for urban traffic management, or wherever space is at a premium. The LED screen can display up to 5 lines of text and up to 12 characters per line. Suitable for high speed, urban and trunk roads and preprogrammed with up to 200 highways approved messages, the 4280 is often used to advise of major events, road closures and utility works. Displays up to 5 lines of text and up to 16 characters per line. The 42100 is ideal for major roads up to 70mph; each sign comes preprogrammed with up to 200 Highways Agency approved messages and pictograms, with the ability to create unique messages. Displays up to 5 lines of text and 20 characters per line.